Even though the Standard and Toy Poodles are really close relative breeds, they still demand for a bit different care and feeding routine. Toy Poodles are extremely cute and playful dogs. You see a Toy Poodle and all you want to do is to shower it with love and affection. Here we will introduce you to the main tips concerning the process of Toy Poodles feeding and the things to know when you are choosing the Toy Poodle best food. 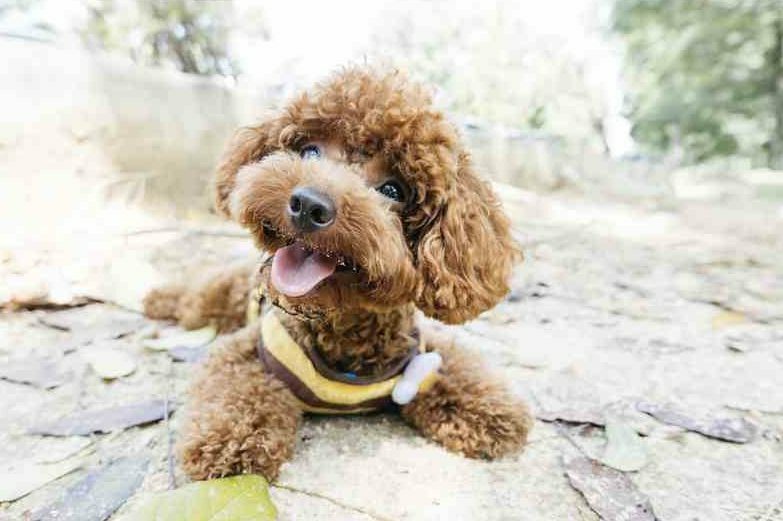 Following these Toy Poodle food recommendations can help you in a long but pleasant process of taking care of your pet. Today our small friends have a great variety of high-quality options to choose from – so many brands create truly awesome toy poodle food in any consistency and with amusing variety of ingredients. But if we get to choose one brand, it would be the Fromm. Not so well-known as many strong brands, it stays rock-solid as one of the best Toy Poodle food brand thanks to the quality of the ingredients, always right micronutrients ratio and the amount of care they put into all of their products. This food is a bit different from the basic formula for dogs you can see everywhere nowadays. 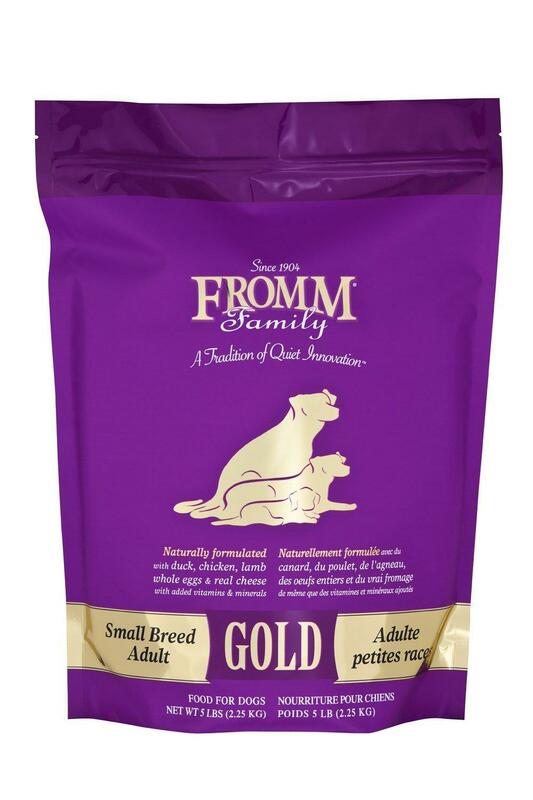 Created with the thought of the small breed, the Fromm formula has everything needed to become truly one of the best dog food for toy poodles. First of all, let’s point out the protein and the calories content in the product. 26% of protein and 416 calories in the cup is a nigher above the average amount of both which can fully fulfill the nutrition needs of an Adult active Toy Poodle. We need to say, that you will find pretty unusual yet very helpful natural components in this food. For example, chicory root which is great for protecting the dogs’ organism from worms or taurine which affects positively brains and eyes functioning. It contains well-known and highly used ingredients like salmon oil for well-groomed coat or the probiotics for better metabolism. It is grain free and wheat free. But take a notice, that the food contains whole eggs and cheese, which is another rather unusual component for the dogs food. Make sure that you Toy Poodle doesn’t have food allergy to any of these components. By the way, if your dog is a picky eater, you can try this one out as the majority of dogs love the taste of this food. 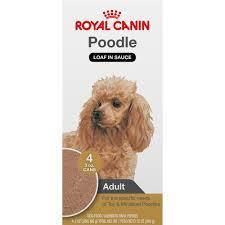 Royal Canin took a step further and created a food formula specifically for Miniature and Toy Poodles. This one is the wet food, but we see it more as a topping or an addition to the main dry course as it has a lower protein ratio than needed. But in general, this can be an excellent addition to your Poodles’ diet as it stimulates appetite and can be digested fast and easy. Wet formula keeps the water balance in the dogs’ organism on the right level and goes soft on tender stomachs. This is a simple and pretty basic wet formula though, that has everything needed for aging support and making sure that your dog will have silky coat and strong muscles. Perfect for adult Toy Poodles without health issues or allergies. 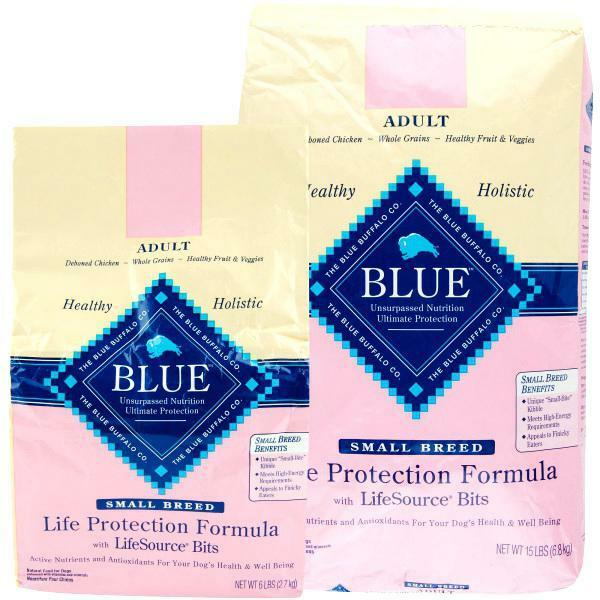 If your Toy Poodle doesn’t suffer from various food allergies or often cases of the upset stomach but you still want to play safe with the dogs’ food – you can try out dry food made by Blue Buffalo. 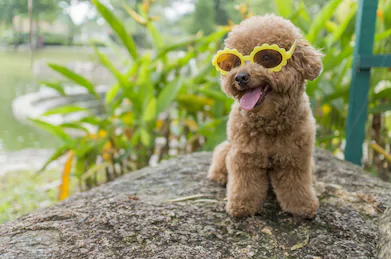 Well-known all over the world for the high-quality ingredients, extreme safety and the specific health protecting formula, this is a high-class example of a dog food for Toy Poodles. This brand has a very unique formula: the pack contains two different kibbles of food. One is the simple meat and veggies mix with a great taste and high-nutrition value while the second is the so-called “Life source bits”, which is basically a mix of healthy stuff like vitamins, omega fatty acids, probiotics etc. This food takes care about all of the life-important systems of your Poodle that might need an additional support during the aging process. Higher protein and carb ratio makes sure that your dog will always have enough energy for playing and his active lifestyle. Healthy joints, coat and immune system – all supported by the mix of needed micro elements, minerals and antioxidants. Please, take a notice that this one, in particular, is not a grain-free formula. So, if your dog experience the allergy to grain, you can choose the same formula but without grain content. Poodles in general and Toy Poodles in particular, are a breed that can suffer hard from various food allergies. Toy Poodles can also have simply sensitive stomachs and react bad for many common dog food ingredients. 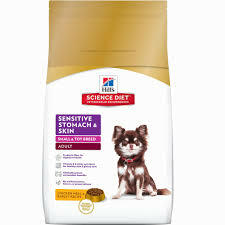 Luckily, such brands as the Hill’s Science Diet come out with the dog food formula for sensitive stomachs. This one also takes a good care of the skin and protects your dog from all sorts of negative food reactions.The formula contains very specific probiotic fiber from beet pulp which takes care about your dogs’ digestive system. Immune system is protected by the mix of antioxidants and vitamins E and C. Moreover, generous addition of the omega fatty acids make skin and coat healthy and well-groomed. This dog food is highly recommended for dogs who experience occasional loose stools or bad tolerating with current food they are having on the daily basis. The first ingredient and the main component here is brown rice, which is known for its ability to help through digestion and keep the poops solid. Even though the meat here is only on the second place after the brown rice, the protein ratio is still pretty high – 23%. Which is completely enough to fulfill the nutrition needs of an Adult Toy Poodle. Some customers noticed a bad smelling gases from their dogs when being fed with this food. If this is your case, you can use the Hill’s food as a diet or in-between one for allergy periods. The question on which is the best food for Toy Poodles puppies troubles any newbie puppy owner. They are so small, cute and absolutely vulnerable, that your main and first desire will be to care about this prettiest balls of fur. High-quality food is extremely important for puppies as they are growing and their organisms need lot of calories, protein, fats and carbs all the time. Moreover, such things like skin, bones and muscles support is another great thing that can help your pup develop and grow healthier and stronger. 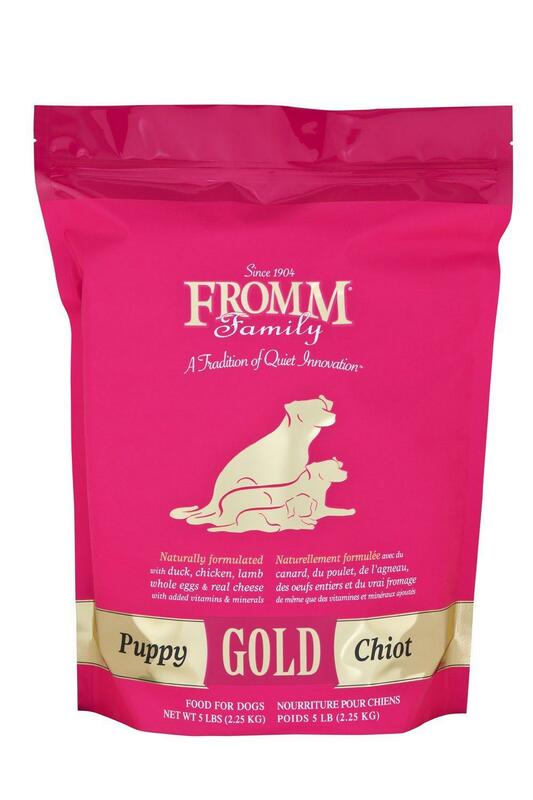 This great food for puppies by Fromm is full of real meat. And not only one sort, but all natural duck, chicken and lamb meat! Along with healthy and helpful oatmeal and brown rice, the food has the most healthy type of grains possible that not only give a nice carb ratio but help in many ways as well. For example, brown rice helps with protecting puppies from loose stool and the oatmeal helps with metabolism and food assimilating. This is a great product for keeping your pup happy and energetic. It provides all needed support for the growing organism while being completely natural and safe. We honestly couldn’t find any negative features of this dog food apart from being a bit pricy. When your Toy Poodle hits the mark of 7th year, it is time to change the formula of his daily food. Why? Because with age, organism of the Toy Poodles starts needing more and more support. Especially with the work of immune system and joints. 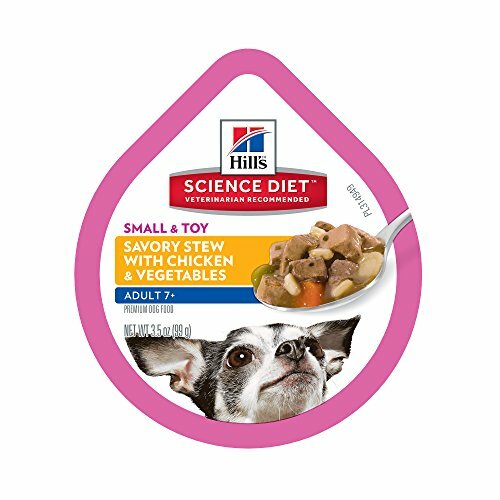 Hill’s Science Diet has a line of dog food suitable for nutrition needs of the senior dogs. This food, in particular, comes in the wet consistency which helps to persuade even picky eaters (and some Poodles can turn into those with aging) to try it out. Gentle fibers and half-wet, half-soft consistency of the food goes easy on the senior dogs’ stomachs. Basically, it goes soft in and comes smooth out. Of course, we would still recommend mix this food with dry food for senior Toy Poodles to, at least, take additional care about dogs’ teeth. Also, take a notice, that one tray has only 6g of protein. We must say, that this kind of peel-of ready small portioned food packaging is very comfortable to use as you don’t need to measure food portions each time. If, for any reason, your dog cannot eat the hard dry food – this one can become an excellent everyday ratio. Soft on teeth and stomachs, it has the right dose of antioxidants, calcium and vitamins to keep your senior Toy Poodle energized and happy. 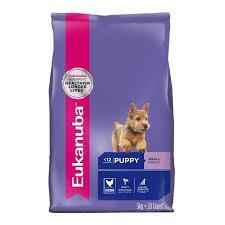 Eukanuba is an amazing brand that cares a lot about dogs and small breeds in particular. The line has various food formulas depending on size or age of the dogs. We’ve picked the one that is absolutely awesome for small breed puppies. You can use this dry food for feeding your pup until he hits the 12 months age mark. The food has a higher protein and fats ratio, which, as we already know, a perfect solution for growing pups and their metabolism. Addition of natural salmon oil helps with brain development and takes care about the pups’ shiny and soft coat. This food is recommended and used by many breeders as it has all the basic components to keep the puppies healthy and fully energized for their playful lifestyle. Really small kibbles with tender fiber fit perfectly into small chaps and can be processed fast and effortless by still not so strong puppy stomachs. Though, the food contain the chicken by-products, which tastes good but can cause a negative allergy of food reaction from some dogs. Always observe carefully on how your pup is getting used to new food and consult your local vet before changing the food. What To Know About Feeding The Toy Poodles? Toy Poodles are gorgeous and friendly animals. They can grant you with lots of love and affection and requires a bit of good care in return. When you are starting to learn more about the Toy Poodles feeding process, the main thing you need to always keep in mind as that Toy Poodles are a part of allergic breed. This means that they can have various allergies, often to the concrete food ingredients, that can affect their health and happiness. Toy poodle food allergies can be diagnosed by your local vet. The main symptoms that scream “allergy!” are: vomiting, diarrhea, skin problems and even the bad mood. Common toy poodle allergies are reactions to grain, corn, liver and wheat. Any artificial preservative, coloring or flavor can cause hard allergy reaction! With any symptoms of this type or reaction or food poisoning, consult the vet immediately. Another issue you can struggle with during the feeding process is the Toy Poodle food aggression. What is it and how to fix the situation? Some Toy Poodles can become aggressive and overprotective when it comes to their food. It results in growling or even barking and biting anyone who comes near when the dog is eating. Among the ways of defeating the food aggression are such: hand feeding; trust building; demonstrating where the food comes from and teaching your pet to respect you. Now, let’s discuss the most often asked question – what is the right Toy Poodle food amount to feed daily? Easiest way to set the feeding base is to follow the instructions on the food package that you’ve bought. Commonly, ready food with high-quality natural ingredients already has calculated amount of calories and micronutrients in one cup. Of course, each dog is an individual with personal preferences and needs, and you might have to adjust the basic feeding process to them. For example, if you see that after the feeding, the Poodles’ bowl is swept clean – try adding a bit more of food next time. Always remember to give your pet lots of water, especially if his main course is the dry food! Important thing to know is that through aging process, the nutrition needs of your Toy Poodle will change. For example, the most need of protein and fats hits the Poodles as they are puppies and after the reaching the age of 7 years. As for the amount of calories your Poodle must get through the day, the meaning shifts from about 1200 calories when they are puppies to the approximately 330 calories when they become adults. The number drops a bit with age and the perfect stated amount of calories for average senior Toy poodle is just 260 calories a day. Nevertheless, you can change these numbers according to your dogs’ needs as well. For example, Adult Toy Poodles that are highly active might need a doubled average amount of calories daily. Buyer’s Guide: What Is The Best Food For Toy Poodles? Remember, that artificial additions can cause severe cases of food allergy! Natural components are tasty and appetizing enough for your dog to love it. Not to mention, that this is the healthiest way to take care of your Toy Poodle. The component named first in the list of ingredients is the main one. If you see that meat comes in the second place, it means that there might not be enough of it. Meat is the main source of protein and the most desirable food for any dog. Always check the ratio of proteins, carbs and fats in the food. Consider the amount and percentage of all micronutrients depending on your dogs’ age and activity level. The same as with the previous feature, the amount of calories must correspond with the dogs’ age, activity and other personal needs. Many recent dog food formulas contain additional healthy and natural supplements that can help in keeping your dog in great condition. Salmon or seed oils, antioxidants, mix of vitamins etc. All these additions support greatly work of many systems in dogs’ organism and are highly recommended. Small chaps of the Toy Poodles can’t handle large kibbles of the regular dog food. Seek for the dog food developed for the small breeds with small sized kibbles and tender fibers that are easy to digest.